What is black, white, and cute all over? Chengdu may be known as the food capital of China, but for the first time in our travels, Simon and I weren’t interested in exploring a city through our tummies. 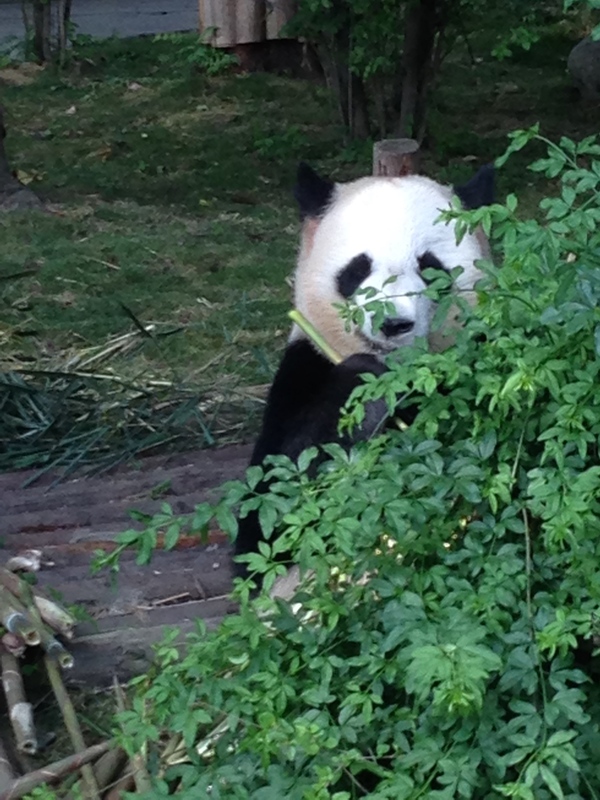 Our main mission in Chengdu was to hug a panda bear. Unfortunately, we later found out that this panda “hugging program” was discontinued until further notice. We cried ourselvs to sleep in our hostel bunk beds that night. 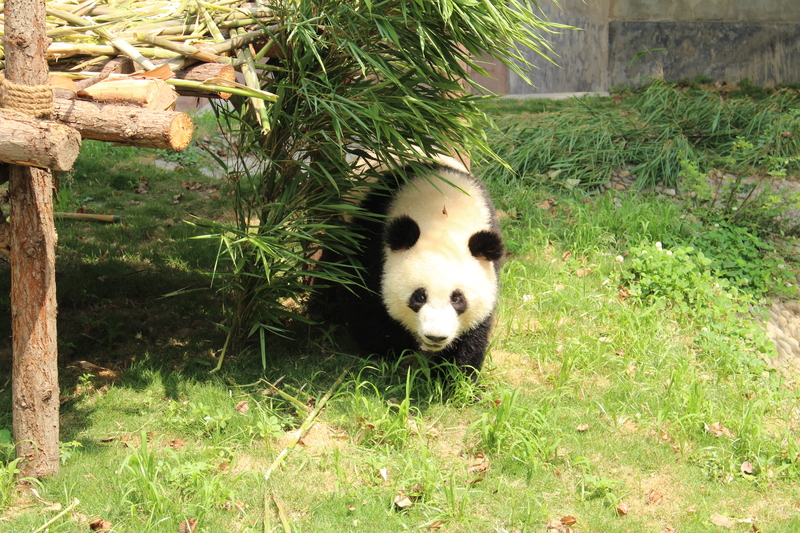 Pandas are endangered species, and to compound this issue, they also have trouble mating in the wild. That’s where Chengdu’s Research Base of Giant Panda Breeding steps in. Not only do they set the mood for adult pandas to mate, but they also provide a nurturing environment to raise fragile young pandas into adulthood. 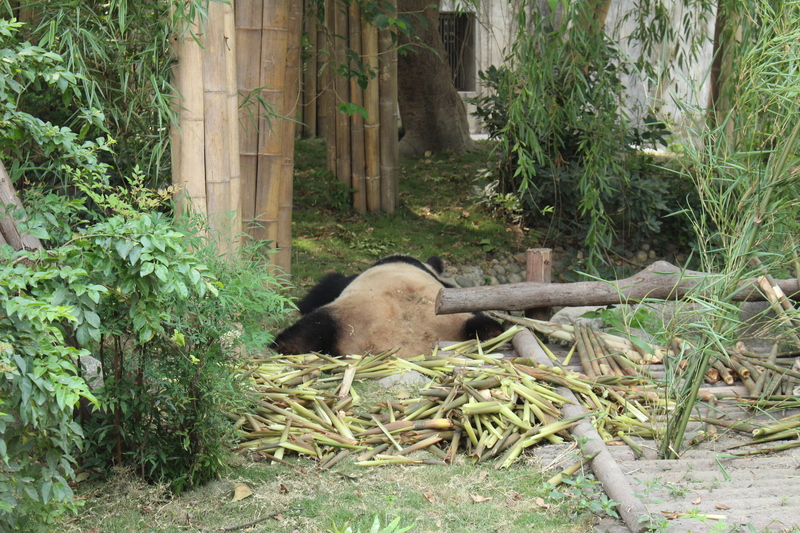 Panda feeding occurs in the morning at the research base, so timing your visit there is essential. Simon and I frantically ran across the park after paying the entrance fees, fearing that we were too late. Luckily, we were just in time. As soon as a panda emerged onto the outdoor feeding area, a hush fell over the waiting visitors and conversations halted to mere whispers. Simon and I went from never ever seeing a panda in real life to witnessing several dozen pandas chow down in a gluttonous fashion. Eat, sleep, repeat – we could watch them for hours, hypnotized by their black teardrop shaped eye patches that seem to stare into your soul. The sound of them shredding apart the outer layers of bamboo shoots and chomping on the crunchy juicy core in the middle was just as relaxing as watching them. Pandas don’t need to do much to win over the crowd’s affection. They’re cute and that’s a fact. With their peaceful demeanor and cuddly black and white coat of fur, it is no wonder they are considered China’s national treasure.